From unparalleled performance opportunities and distinguished faculty to the region’s longest-running theater and plans for a new state-of-the-art performance complex, find out why Rollins was recently ranked among the nation’s top 25 BA theater programs. 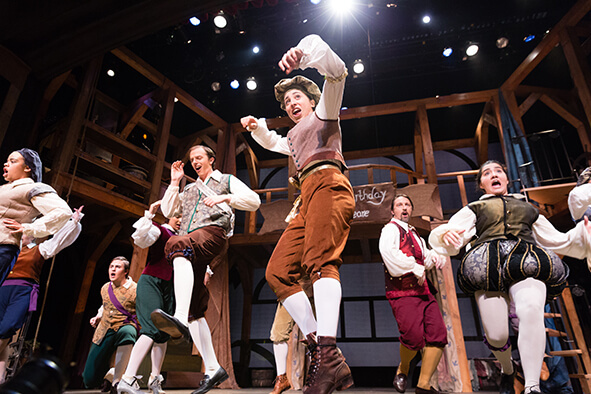 OnStage has ranked Rollins one of the top 25 BA theater programs in the country and the No. 1 program in Florida. Explore your art, and hone your craft. Be exposed to the depth of theatre history, literature, theory, and criticism while training in acting, directing, design, and technical theatre. The theatre arts program is designed to give you a comprehensively integrated liberal arts foundation by encouraging you to complement your studies with other disciplines. Performance is also a major component of your theatrical education, with the department producing eight theatre and dance productions per year at two on-campus venues. 1. Holistic Training Our curriculum provides the opportunity to study theatre from multiple angles and perspectives. Our graduates are prepared for vibrant lives in the arts. 2. Individualized Plans of Study Forge the path that’s perfect for you, drawing from our five areas of emphasis: design and technical theater, directing, dramaturgy, musical theater, and performance. 3. Deeply Connected Learning Our approach to learning is demanding and thought-provoking. You’ll be invited to jump in, get your hands dirty, and take risks in the classroom, on our stages, with our community partners, and in our international field studies. As artists in a liberal arts environment, we encourage you to explore the rich variety of courses within our department, where you’ll find small classes, one-on-one advising, and a commitment to flexibility and responsiveness. Fundamentals of Theatrical Design You’ll learn the creative process fundamental to designing for the stage, with a focus on visual communication and critical response. Topics include drawing, painting, collage, and research projects. Upon completion of the course, students are prepared to specialize in design areas such as lighting, sound, scenic, and costumes. Improvisational Theatre I: Fundamentals This course investigates the foundational concepts and principles of improvisational theater that enable collaborative, spontaneous play. Emphasis is given to narrative, scenic structure, and team-based creativity. Acting for Musical Theatre I Here you’ll delve into lyric analysis and the history and context of different writing styles, including classical aria, 19th-century patter song, American standard, and Broadway and West End musicals. Directing I: Fundamentals This course introduces directing terminology, formulation of ground plan, communication with actors, and concepts such as visual pause, beats, and blocking. Modern I Discover the fundamentals, vocabulary, and history of modern dance in a non-threatening, non-judgmental environment. Together, we will develop and stretch your movement boundaries, focusing on self-discovery, self-discipline, and self-expression. Theatre for Social Change Exploring modern theatrical practices that utilize performance to facilitate heightened social awareness and change, you’ll consider a variety of performance practices, such as theater of the oppressed, psycho/sociodrama, theater-in-education, and playback theater. Voice III-Dialects You’ll study the process of speech mechanics associated with patterns of speech other than Standard American—and will nail that Irish brogue by the end.